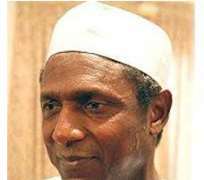 President Umaru Musa Yar'Adua is billed to return to Nigeria next week, one of the medical doctors attending to the President at King Faisal Specialist Hospital and Research Centre in Jeddah, said yesterday. The doctor told Deutsche Presse-Agentur, a German news agency under anonymity yesterday in Riyadh, Saudi Arabia, that Yar'Adua was no longer in the intensive care wing of the hospital and was undergoing routine medical tests. This development corroborates the claims of the Nigerian Ambassador to Saudi Arabia, Alhaji Abdullahi Garba Aminchi, that the president was fit enough to return to Nigeria anytime next week. Aminchi told newsmen in Makkah, Saudi Arabia, that the call on the president to resign from office as a result of his ill-health was out of place. “President Umaru Yar'Adua has been attended to by his doctor." He was given a week to recuperate after which he will be examined again. From the one week, he has just spent two days (Thursday). So, he still has five days to recuperate. “After one week rest, if he is certified fit and capable to return home and resume his work, God willing, he will be back in Nigeria by next week,” Aminchi said. He dismissed insinuations making round among Nigerian pilgrims in Makkah that the president was brought to the Mount Arafat by Saudi medical officials to pray and take part in the Hajj rites. The ambassador frowned at the spate of criticisms going on in Nigeria and the call on the president to resign from office, describing the euphoria generated by the president's trip for medical check-up as uncalled for. According to him, Yar'Adua could not become president of Nigeria if it has not pleased God or if God did not approve it, advising critics of the president to wait for their own time. Aminchi thanked all Nigerians who had been praying for the president, especially Nigerian pilgrims currently in Saudi Arabia and government officials. When contacted on the development, Special Adviser to the President on Media and Publicity, Mr. Olusegun Adeniyi, yesterday said he had no information to give. Gombe State Governor, Alhaji Mohammed Goje and his Edo State counterpart, Comrade Adams Oshiomhole, yesterday took a swipe at politicians and other Nigerians calling for the resignation of the president from office. Speaking at Okada, Edo State, yesterday, during the 7th graduation ceremony of Igbinedion University, the governors said those making the call were seeking easy way to power. Goje said: “If democracy is to be sustained, we should not be sentimental. We should pray to God to speedily give better health to Yar'Adua.” He said anything that would bring instability to the country was unpatriotic and admonished Nigerians to pray for the President because, “God who gives life and everything will save His people.” On his part, Oshiomhole said:“All of us have the duty to pray for our president. Yar'Adua has made contributions to ensuring the peace and stability of this country at very difficult times. I do not belong to the same umbrella with him but we belong to the same country. “Yar'Adua is an asset to this country. He is a statesman. We are in a democracy and we have people who look at issues in terms of immediate political calculation. Unknown to many Nigerians, Yar'Adua has demonstrated certain qualities of leadership that are uncommon. I am speaking with authority because I have been privileged to interact with many leaders. That is critical to the growth and development of this country,” he said. Yar'Adua, 58, had suffered severe chest pain a fortnight ago and medical examination revealed that the President is suffering from acute pericarditis, (an inflammatory condition of the coverings of the heart).